Scott Thompson tapped as new leader of portal company. Well, at least he won't say f*#k in the company's quarterly analyst call. 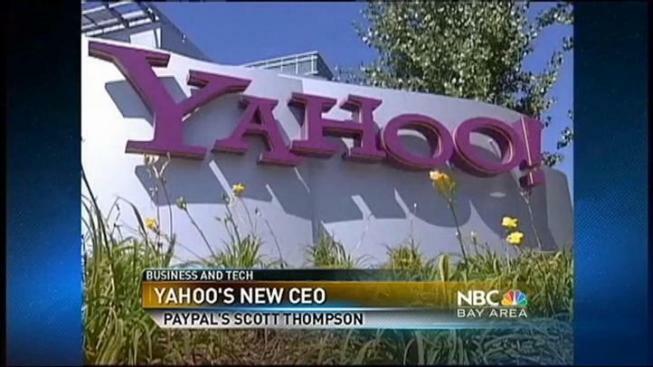 Scott Thompson of PayPal is the new CEO of Yahoo, replacing interim CEO Tim Morse, who replaced naughty-tounged Carol Bartz. Wall Street is not impressed. Yahoo shares traded 2 percent lower at the open today. Yahoo's board -- the second most bizarre board in Silicon Valley behind Hewlett Packard -- has a poor record of picking CEO's. Did they finally get it right this time? He's no showboater -- just check out his dry Boston-accented assessment of micropayments during his visit to Press:Here (below). What Thompson appears to do well is structure and run businesses. That may be exactly the person Yahoo needs as it decides what to do next. Board chairman Roy Bostock: "[Thompson will help conduct a] strategic review process to identify the best approaches for the Company and its shareholders. As part of this process, Yahoo! is considering a wide range of opportunities for the Company's business, as well as specific investments or dispositions of assets." That's business-speak for "we picked a guy who knows how to structure and restructure businesses because we really have no idea what in this company is worth keeping and what needs ditching and we could really use an expert." Analysts have their doubts. In a conference call with reporters this morning, one asked for a specific experience Thompson had at PayPal that would carry over to Yahoo. The answer: that PayPal has to balance the needs of buyers and sellers and Yahoo has to balance users and advertisers. A bit weak. Yahoo employees we've talked to have a "wait and see" attitude; Thompson doesn't start work until Monday and they've been under an interim CEO for months now. If Yahoo's falling stock price this morning hurts Thompson's feelings, he can always look at eBay's stock: it's down about 4% on the news he's leaving.